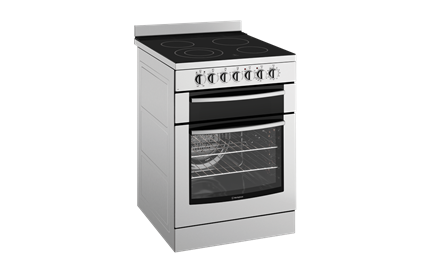 60cm Electric oven with ceramic hob is rated 4.7 out of 5 by 15. 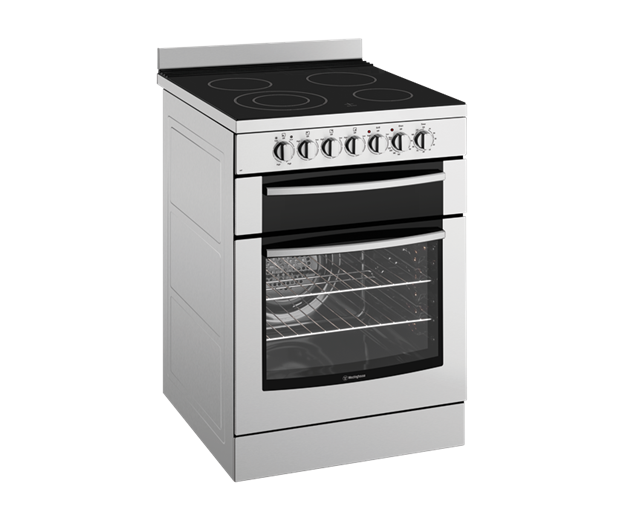 Stainless steel 60cm freestanding cooker with fan forced electric oven, separate electric grill, 2 hour timer and electric hob with 4 zone ceramic glass. Rated 4 out of 5 by Horse from Can't keep the top clean without jif. There's not much room in the grill, but how do you clean the ceramic top, after use there's a stain on each ring and theres no food or anything on it. It just discolours when it heats up. Any suggestions? Rated 3 out of 5 by Smiley from Great oven Really enjoy using this oven and looks great. What I have a problem with and why I wouldn't buy it again due simply to lacking a grill option in the oven really annoying when you want to grill the top of a dish. Rated 4 out of 5 by Burb from Good Quality Stove Replaced an older Westinghouse stove with this model in a kitchen makeover. After a month we're generally happy with its performance. 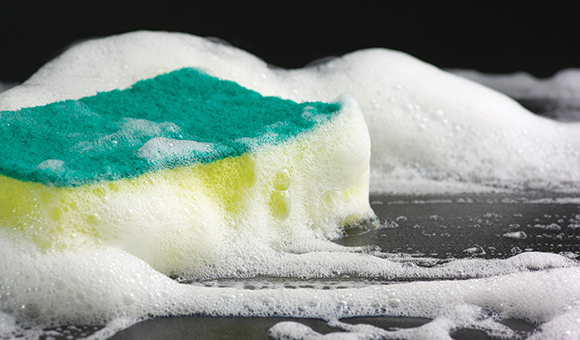 The clean lines, stainless steel, glass top and having the controls in the front mean it is very easy to clean. Much lighter stove than the older model. So much so it needs a plate screwed to the floor at the back to lock it down and keep from tilting. Be very careful when installing this plate. It has razor sharp edges. Sliced two fingers and had to wear thick gloves to finish the job. My only other minor issue is that after being assured by Westinghouse that the grill opened as one unit we found that in fact the grill is a separate slide-out section once the griller door is open. It slides so well that we had to put some small chocks under the front of the stove to stop it sliding out every time the griller door was opened. All in all though, a good stove. Rated 5 out of 5 by Fran and Graham from We are very happy with this electric stove We bought our Westinghouse about three months ago and have given it a good workout.The tops and oven heat up very fast, a lot quicker than we are used to. Should have upgraded a long time ago.It is for us, a learning curve to use, as it it so different to our old appliance. Westinghouse have a winner here. Rated 5 out of 5 by Sue t from Great looking upright cooker Time for a change had a Beko upright and decided to upgrade to a WFE647sa best thing I've purchased in a long time very quick hot plates to heat up and oven is very quiet. Only had it installed 1 week ago but am most happy with it. Rated 5 out of 5 by Bootenal from Great electric stove! This stove replaced a 10 year old one which did good service. The improvement when using this one is fantastic - larger cook top, strong glass top, excellent oven. Thanks guys!